The excellent wines by Knipser Winery age for years in barrels and bottles. Time is the most important factor to their quality and flavour. In order to adequately commemorate the wine year of 2012 with clients and collectors, a unique packaging was created for a limited edition Cuvée XR, which was supposed to be bottled in 2015 after three years of ripening in barrels. The idea for the design was to create not only an innovative bottle label, but also an entire bottle that would turn the message of the wine into a visual and tactile experience. 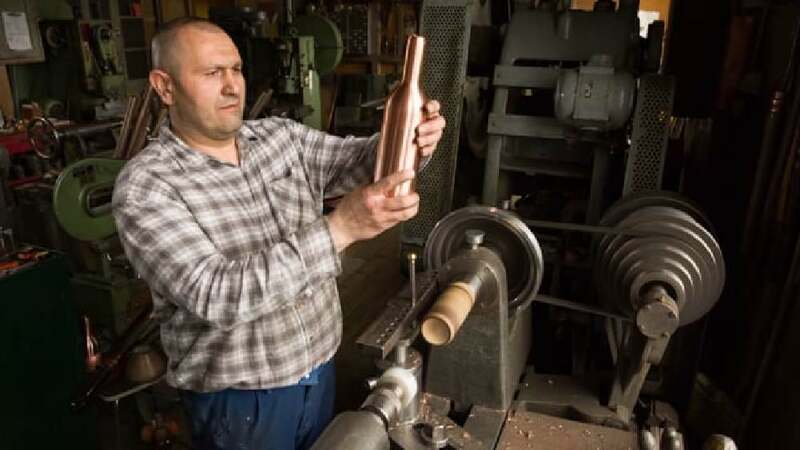 Therefore, a special seamless copper jacket, wrapping the bottle, was created to make the ageing process inside the bottle visible on the outside. This conveys the notion that the longer the wine ripens in the bottle, the more the copper jacket “ripens” too, visualising the ripening process by changing its surface colour. The bottle thus turns into a unique, individual and, above all, natural design item, changing with and marked by time. In addition, it reflects the corporate message reading “True greatness comes with age”. Equipping the bottle of this limited wine edition with a copper jacket stands out as a brilliant idea. Without the need for words, this directly reflects the most important factor for wines, namely time to ripen and developing the best flavour. It is this very process, which takes place inside the bottle, that the packaging design makes visible on the outside – thus lending the object an outer appearance that is as unique as the adventure of experiencing the flavour of this natural product.